Welcome to the December Blainletter. And a special welcome to my two new subscribers. That's right, all of two new subscribers this month. 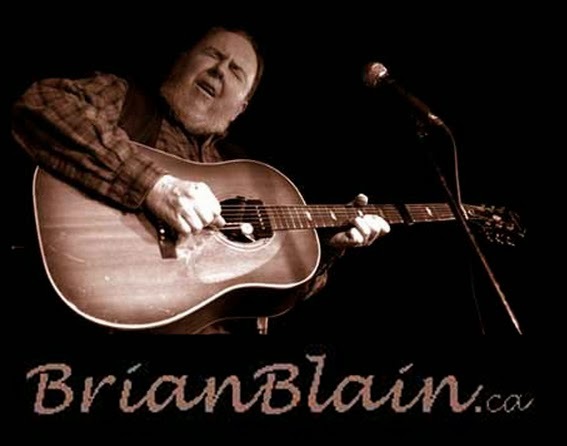 So I'm launching a social media campaign and if you're reading this for the first time on Facebook or Google+ or otherwise, please swing over to www.brianblain.com and sign up to receive it every month in your email (apologies if you got multiple copies - this is a one-time blast). And if it's not too early, let me wish you a great holiday season to celebrate whatever you celebrate. I'm celebrating that we actually made it to the end of the year without the sky falling. Then again, the year is not over. I'm always being encouraged to have more women at the Campfire and Kim Doolittle will bring some powerful female energy to our jam with her down home sound steeped in roots blues, folk, and a hint of alternative country. Steve will be holding down the piano bench for this one, but he is the consummate multi-instrumentalist and he'll be also be playing whatever. Steve’s band, MonkeyJunk, is a multiple Maple Blues and Juno Award winner and Steve has won numerous awards and accolades on his own and in collaborations with Colin James, Harry Manx, Paul Reddick and many others. Sean Pinchin plays a gritty, authentic blues and I've been looking forward to playing with him ever since I first heard him. His recent album, Monkey Brain, was nominated for a Juno Award. Monkey Brain meets MonkeyJunk at the Campfire Jam. As I write this, I'm watching the Neil Young webcast on my computer. Live from a little Ontario town I never heard of (his birthplace, I think). I was never a huge Neil Young fan but I'm a big fan of this new technology. There's a democratization happening in the media – You don't have to be Neil Young to go live on Facebook. We might not have all the production values of this Neil Young event, but if it's all about the music like they say, then you just have to make sure the sound is not distorted and that you've got enough light (wow, the NY stream just ended and I'm watching all the credits roll by and there must be a hundred people involved in this production). I will be curious to hear how many people tuned in. Some things happen faster than expected in this wonderful world of technology, and then others just take time. I've been watching the development of webcasting from the beginning, (I was right there at the beginning when we tried it at the Toronto Jazz Festival in 96 or so). Lately I've tuned in to webcasts of the East Coast Music Awards, the Canadian Folk Awards and next month I suppose the Grammys will stream the "day before" award presentations – and those are the ones I'm most interested in. Check out the National Blues Museum Facebook Page for live streaming of local St. Louis bands every Sunday Night. The streaming audience numbers grow every year and kudos to those who didn't abandon the idea because they only had 20 or 30 viewers the first time. I think growing an online audience will be about as hard as growing a walk-up audience. It's pretty slow (until it blows up!) This is the future. Home phones have been replaced by cell phones, terrestrial TV was replaced by cable and now cable is being crushed by Netflix and other online outlets. Broadcasting will be replaced by "narrowcasting" where your device will only offer content that is of interest and spare you scrolling through the rest. And now, artificial intelligence to suggest "If you liked that, you're going to LOVE this!" Interesting that when I went to NeilYoung.com to see if there was any social media integration, you couldn't enter his website without registering your email. Hmmmm. I remember when David Bowie's manager spoke at a music conference a long, long time ago and said that a mailing list was "gold" and every artist should be trying to capture their fans' email addresses – this was way before social media. What a revolution. I was in the ad business in the 60s (in fact I was hired as a junior copywriter at an ad agency when I was 19 because someone told them they needed to get in touch with the "youth market". Well they got more than they bargained for when the guy in the mail room figured if I had a beard he could grow one too. Then he turned on half the creative department at the Christmas party and all hell broke loose. Ah that was the summer of love, 1968. Wait a minute, I'm starting to ramble…. I captured a video clip of that guitar duel - maybe I'll post it later, but I think there's one floating around the interweb already. For a terrific slide show of the entire Women's Blues Revue evening, check out James Dean's Flickr album in the post below. Let me finish by saying I've got some new tunes in the works – and I might even get into the studio in the new year. There's not a lot of gigs coming up but I'm amusing myself with all my electronic music gadgetry (actually one of them is called "Gadget") and somehow not getting discouraged by the one-step-forward-two-steps-back process taming this beast.